Quilted down waistcoat by BETTY BARCLAY: superb­ly soft and feather-light waistcoat made of elegant micro­fibre with a subtle shimmer. Elaborately fashioned sandwich quilting with a striped lining. Small stand-up collar, 2-way zip fastener and flattering, narrow quilting at the waist plus 2 in the side seams incorporated pockets. 100% nylon. Lining 100% polyester. Filling 50% polyester, 45% down, 5%feathers, . Length approx. 23ins. 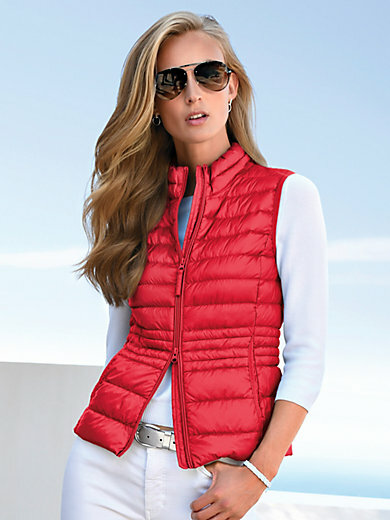 The quilted down waistcoat is machine washable.